Eskema Arquitectos created the design for the offices of global consulting firm, Russell Reynolds, located in Mexico City, Mexico. Eskema Arquitectos team designed a space where the company’s philosophy is experienced: a place where work is a very pleasant activity, and in which the staff members are proud to belong and these is reflected in customer service; achieving a successful and efficient productivity. 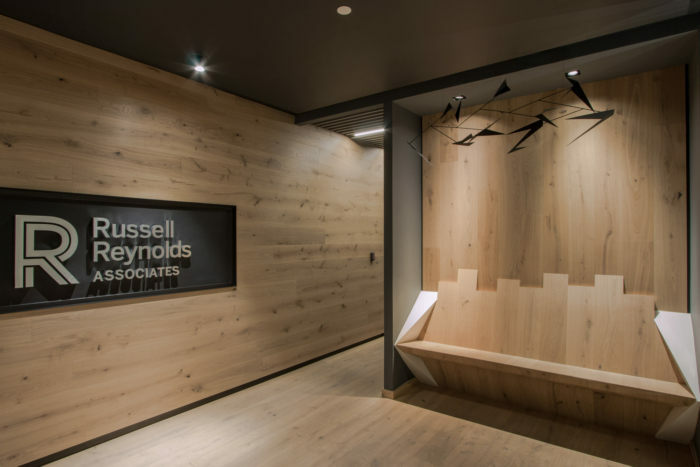 The client was very clear presenting his requirements: it had to be a place with a warm, timeless and not lofty design to show the premium character of Russell Reynolds. 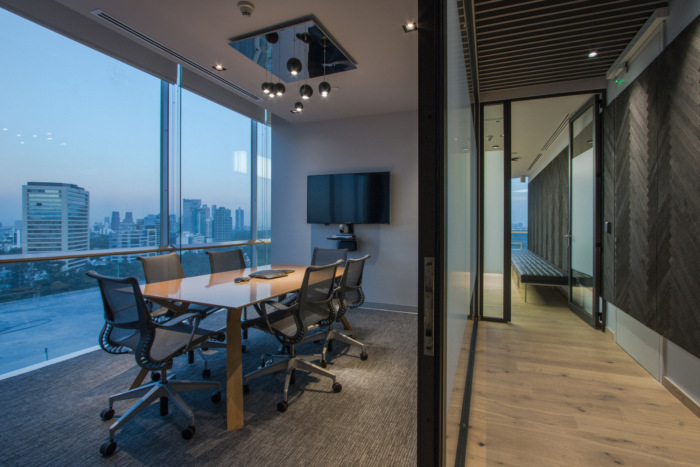 A space with a clearly defined public area for the staff to work and a private area where the clients will feel in a comfortable and secure environment for the interviews and handling of confidential information. Floors and walls are covered in wood creating a refined space that harmonizes with the sober colors and complements the carpet’s elegant design. Even the reception bench —thought more like a transition place and not a waiting area— is a sculptural element integrated to the architecture. The dining room has ceramic floors with a geometric design that goes up to half the wall, thus giving movement and breaking with the monotony more in keeping with the relaxed character of the space, where a dim gray Corian bar is also located to provide service to the users. Integrating fourteen office spaces in a small area was a tough challenge for architects Juan Carlos Jiménez, Luis Manuel Gómez Portugal and Eskema Arquitectos team, however they finished a project that integrates the company’s mystique, the staff working impetus and the cordial atmosphere required for the clients who attend the interviews. An interior design in which everyone enjoys a functional and contemporary workspace.